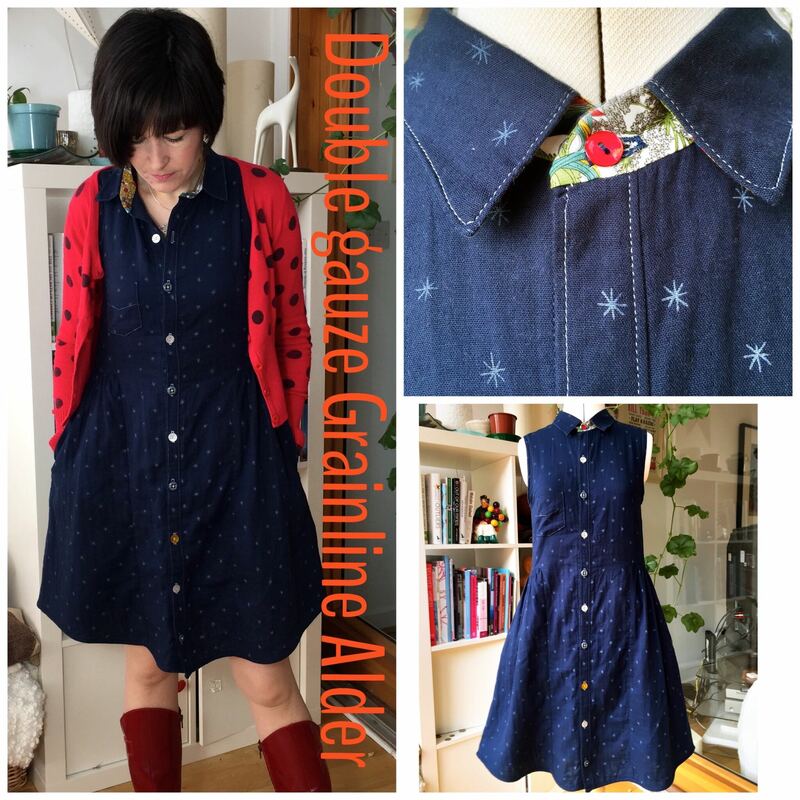 I am loving Grainline Studio’s patterns, they just fit and go together soooo beautifully. I’ve made a few of them now, all really successful, including three Scout Tees. 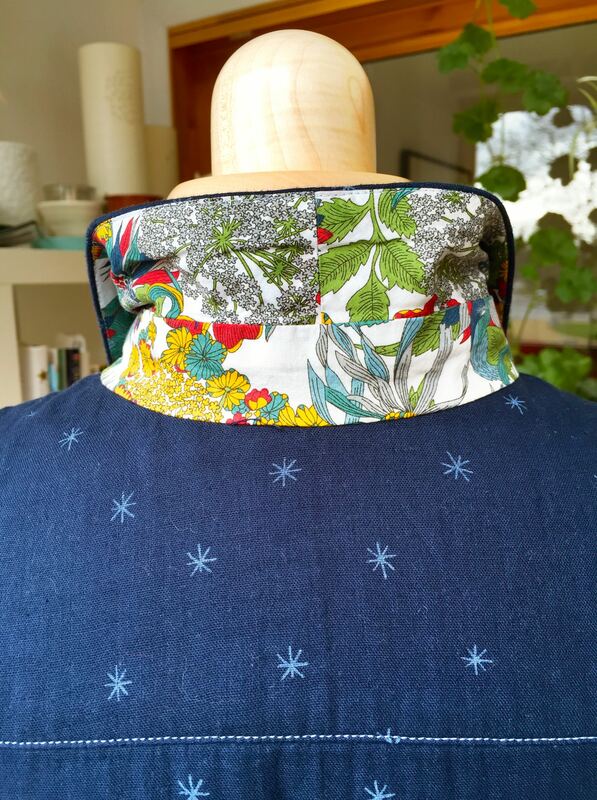 I added a split back detail to two, one in Japanese crepe and the other in a cotton print. 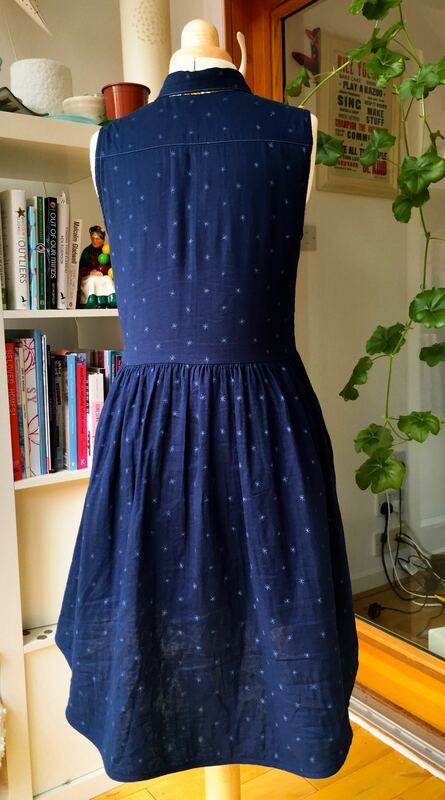 The third was made in a heavier fabric and all cut on the bias. There’s a couple of Tiny Pocket Tanks too, one in Liberty and the other in a left over piece of Cotton and Steel rayon. I’m adding a Talvikki/Linden mash-up in a gorgeous French Terry and an Archer popover variation in double gauze to the list too. They are just really well drafted patterns with great online construction support via the sew-alongs. 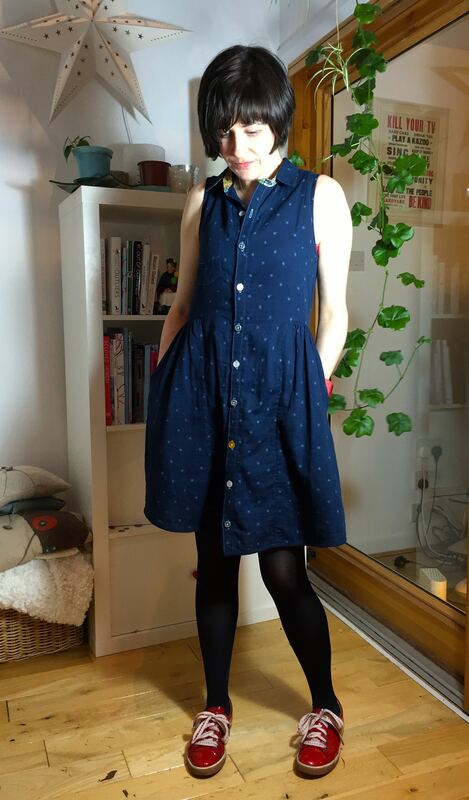 Much as I love my Alder Shirtdress mark 1 with sleeves- it isn’t the easiest garment to just throw on (mostly due to the slightly bonkers choice of fabric). I really love this pattern and wanted to have a go at view B with the gathered skirt but using an easier to wear fabric. 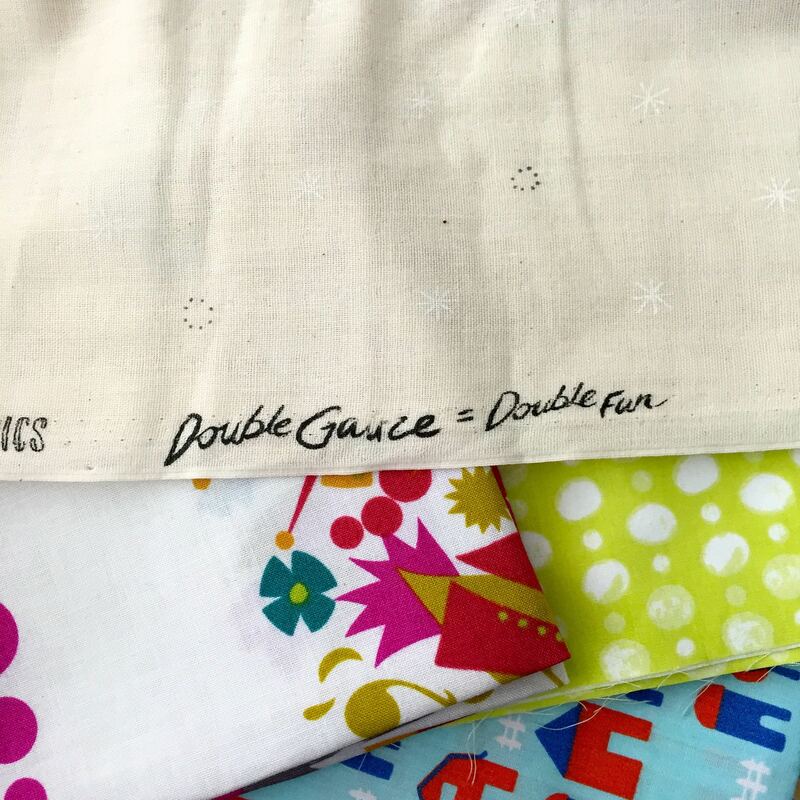 After some online fabric pondering and perusing I ended up buying some rather wonderful Cotton and Steel double gauze in Spark-natural (part of the Bespoke collection) from the grotto of fabric loveliness that is the Village Haberdashery. It arrived in a beautiful spotty envelope with three fat quarters squirrelled away inside as an added bonus! This fabric is some of the softest I’ve come across- seriously beautiful. I did decide the colour was a bit on the pale side for me so being that it is 100% cotton I stuck it in the washing machine with some Dylon machine dye in Jeans Blue and it worked amazingly well. It gave it the look of a really old, washed till they are butter soft, favourite jeans. I love how the little sparks turned blue too. 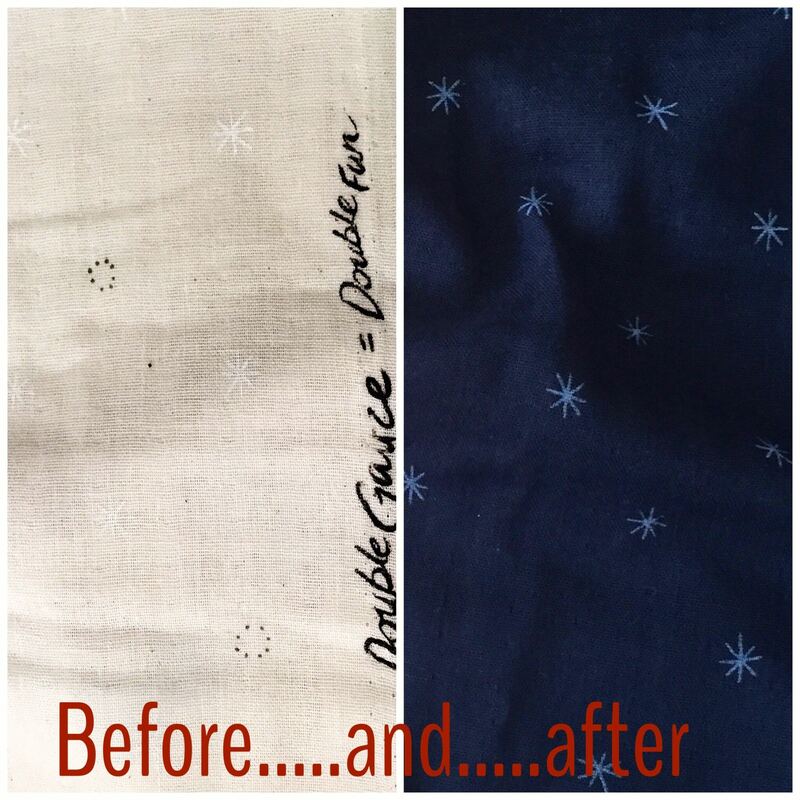 I didn’t make many changes to the pattern when I traced it off because I had already made view A…. I thought about adding shorter sleeves to this version because I’m not a big fan of sleeveless anything. I debated about using the sleeves from the Merchant and Mills Dress Shirt which I really like but in the end decided to go with the pattern and see how it came out- good decision as it turned out. The fabric is really easy to work with because the 2 layers of gauze hold together well; it cuts, sews and presses beautifully. Although the first thing I did was sew the button band on wrong side up so quickly discovered that you wouldn’t want to unpick this too many times; I don’t think it would hold up that well. 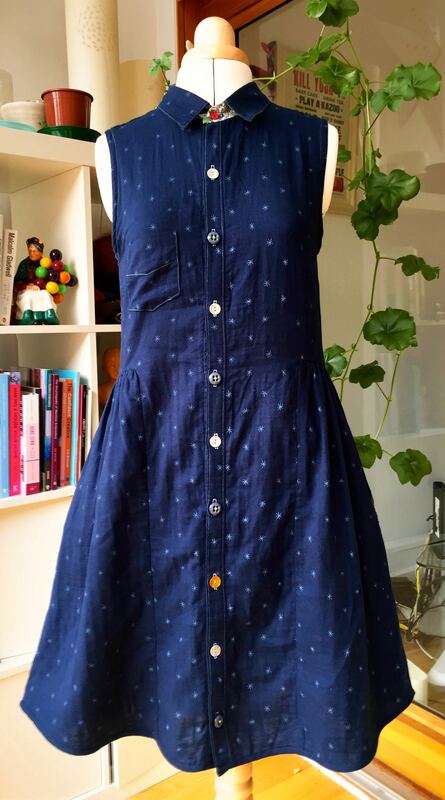 I used some Liberty Tana Lawn, left over from my Miette skirt, for the inside yoke, under collar and collar stand. This gave the collar a bit more body which it wouldn’t have had with the double gauze alone I don’t think. 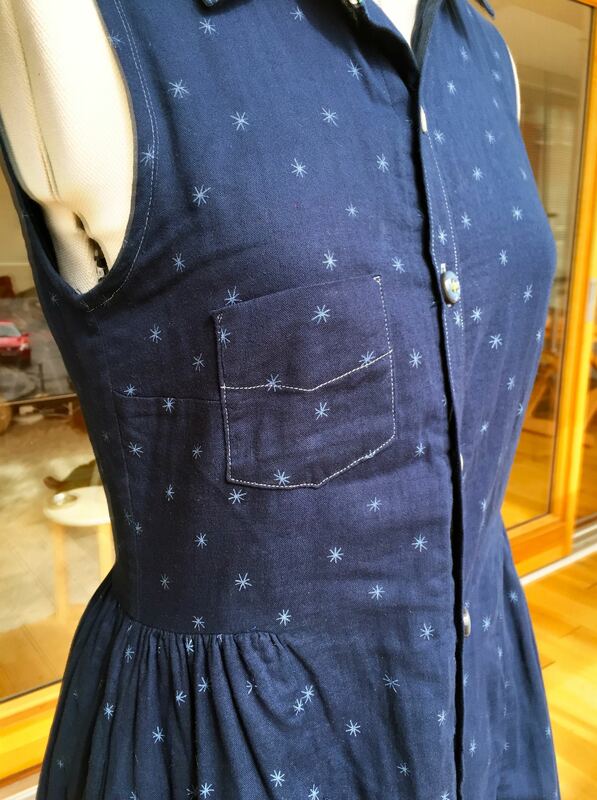 I also used it for the front halves of the in-seam pockets I added and did all the topstitching in blue sew-all thread that matches the little pale blue sparks. The only aspect of the fit I changed was to remove about an inch at the waist on either side. The fit of the dress is quite straight and I wanted it to be a bit more fitted around the waist. I didn’t remove any of the fabric width on the skirt, just adjusted the gathering. This is fine on a light weight fabric but might not be on a medium weight one. I used French seams on the side seams and to join the skirt pieces (and pockets) then made bias binding to finish the seam where the skirt joins the dress. 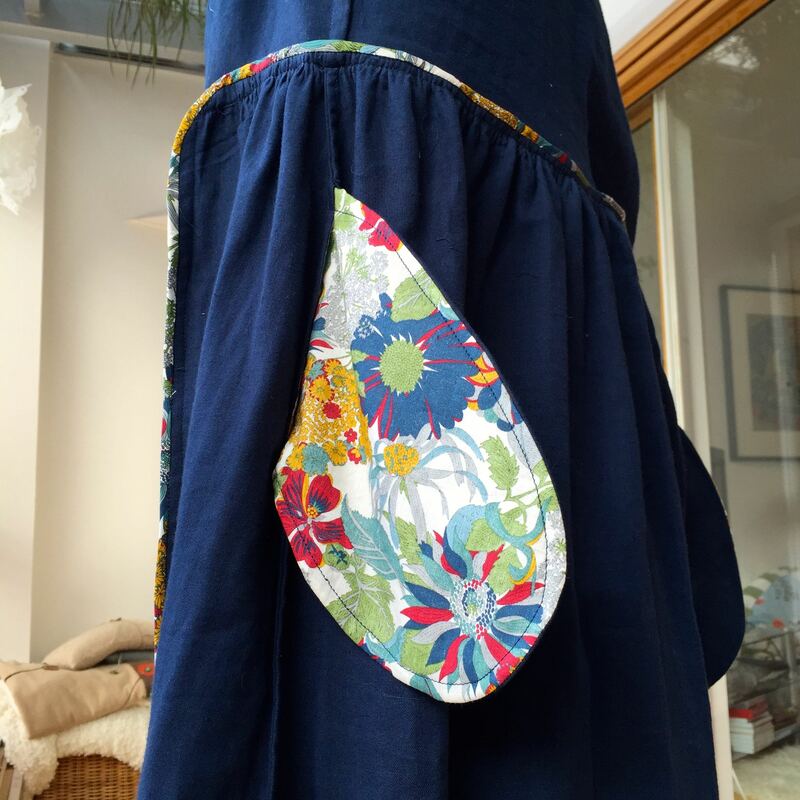 I had a bit of a nightmare making binding from the Tana Lawn during Miette construction and got a very helpful tip from a fellow Instagrammer who suggested to try using spray starch on the fabric before you start; it worked brilliantly- perfect bias binding. 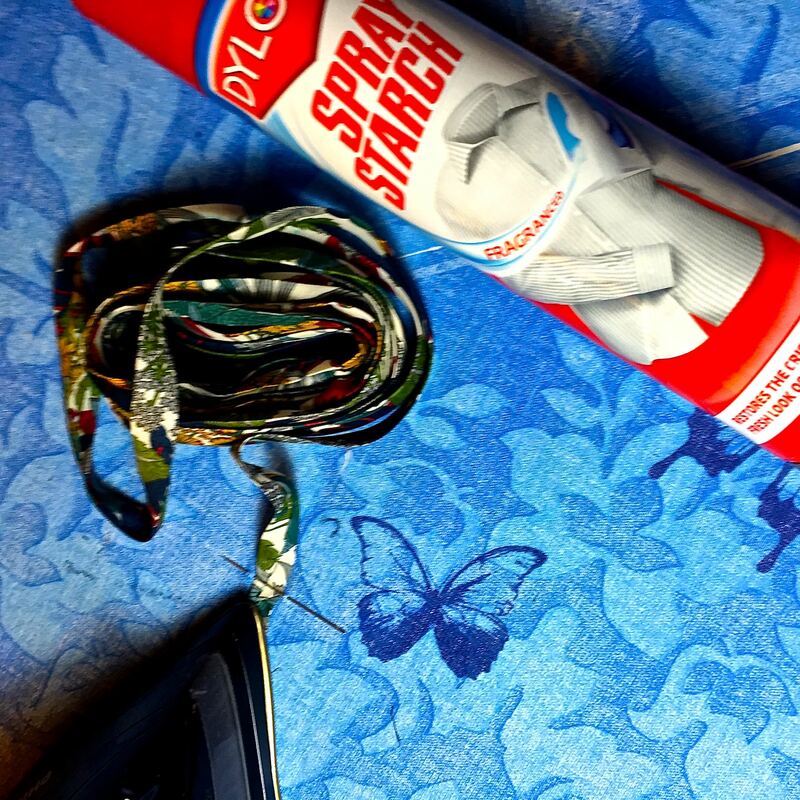 I think there are probably lots of ways to use this when working with sheer and slippery fabrics so the can is now a permanent addition to my sewing kit. I only added one of the two patch pockets. In part because I like the slightly asymmetrical look and, if I’m honest, also because I was a bit worried the pockets wouldn’t be completely identical (slight cop out on my part)! I’m quite happy with the one I have though. Rather than use the suggested half inch hem I made 3/4″ single fold bias binding from the main fabric (spray starch doesn’t work quite as well on the double gauze) and finished it by hand. I love the way it looks and the length is perfect. My best mistake of this entire project was not realising that I had sewed the right button band onto the left side until I had just finished all the button holes i.e. the second last step, right before sewing buttons on. 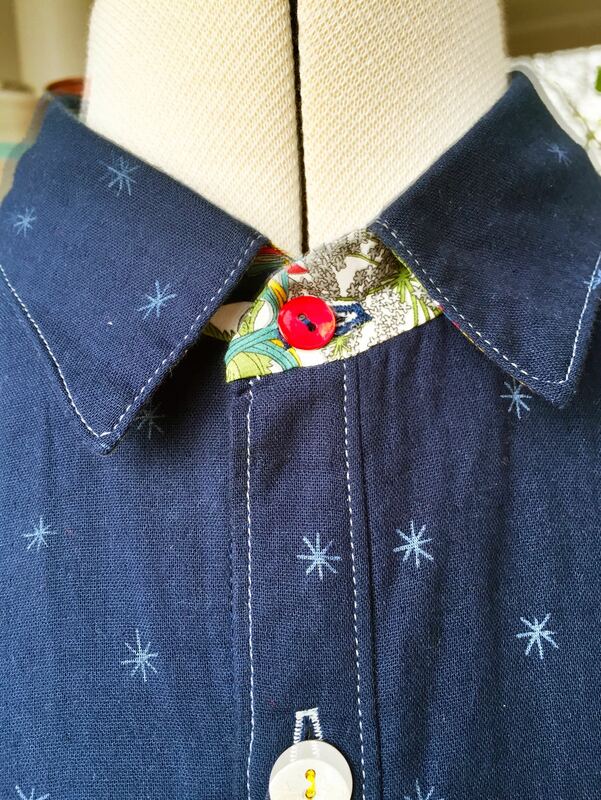 So my Alder buttons up like a boy. My darts also ended being a little bit too low so I’ll need to check on that next time. BUT I really don’t care because I love the colour, I love the feel and I love the fit of this dress…even more than my first one and I love the imperfections because they are mine. The dropped hemline is a beautiful touch on this version and although I’m not usually keen on sleeveless, it just works on this dress. I can already feel another version (or two) coming on. Something more drapey this time I think….maybe a silk or a rayon. Oh my giddy aunt! Such a beautiful dress and the shaping is amazing! I havent been keen on this pattern at all but your version has me kn board. Dont worry about the button band – its completely arbritrary; one day long ago some just decided that women should button towards the heart and men away from the heart! Utter piffle! Some of my most comfy shirts are mens shirts and honestly nobody notices😃.